Ok, before you become too disgusted with mankind let me assure you that this is not an actual product. Instead it’s a bit of guerilla-marketing gone right for a change. 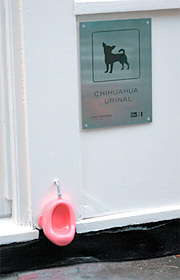 The small, pink urinals were created by M&C Saatchi of London to promote a British reality show (WAGS Boutique) where two groups of women set up and run rival fashion boutiques. The Chihuahua ‘motif’ was chosen because it still seems to be the flavor of the month when it comes to pets for the rich and spoiled. The fake urinals were actually placed in and around the Soho district of London and included stainless steel signs clearly indicating their intended use. Whether or not they were actually used by passing Chihuahuas is unknown, but hopefully they were taken down well before the St. Patrick’s Day celebrations over the weekend. Otherwise I can guarantee they did get used. I’m wondering what Paris Hilton think about this ? 🙂 We all know that she love her little dog.